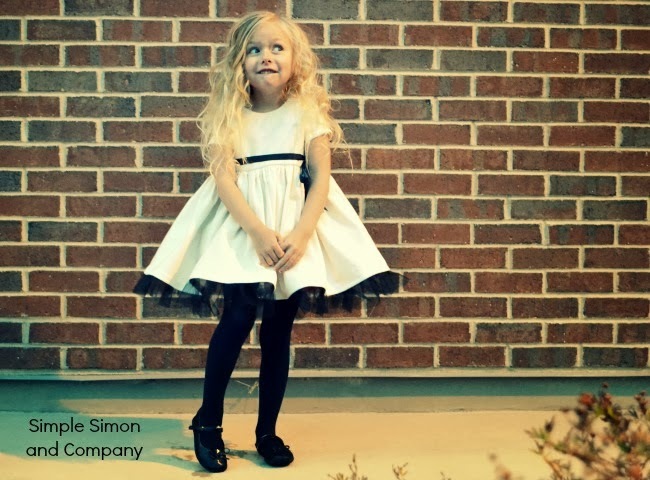 A super cute black and white velvety party dress and a great model! 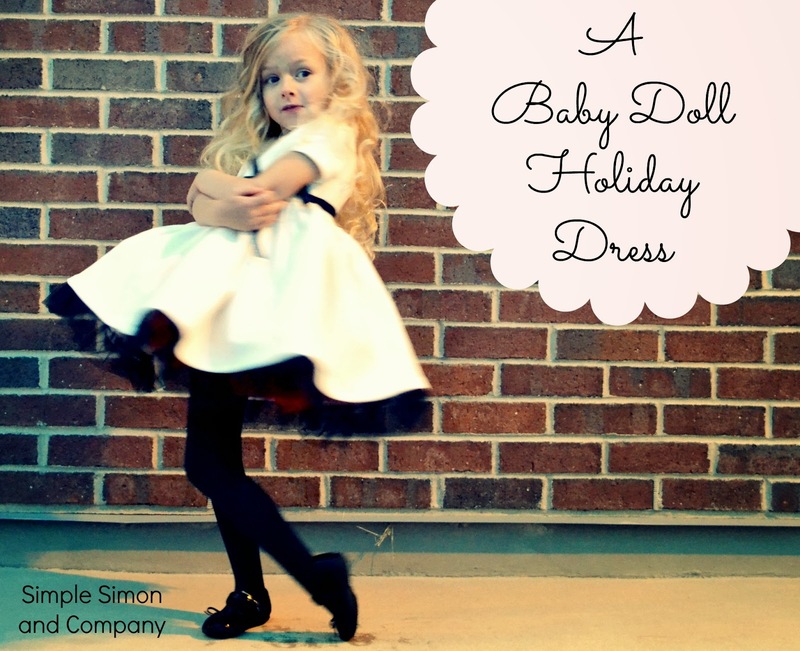 ;) Today's holiday dress inspiration for my series, 7 Days of Holiday Party Dresses, comes from liZ at Simple Simon and Company. Her 5-year-old looks so festive! Hello, Adventure in Dressmaking readers! 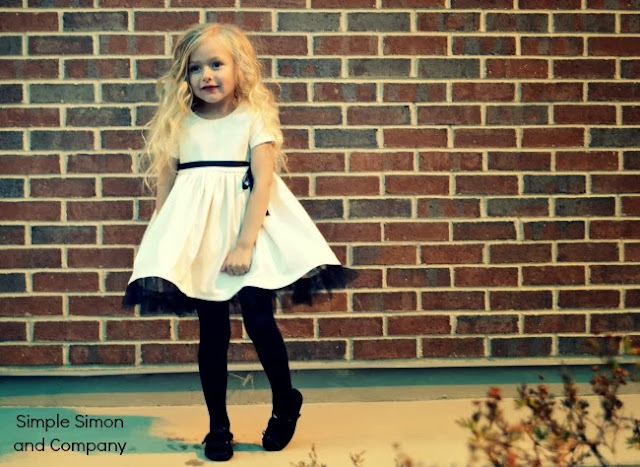 I'm liZ, one of the two Elizabeths over at Simple Simon and Company. Yes, there are two of us...we are sisters-in-law with the same name, age, number of children, former professions, and too many other things to list... and yes, that does make things confusing but it also makes things fun since we both share the same passion for designing and sewing children's clothing! I'm a sucker for extravagant party dresses. Actually I'm ready at anytime to sew up anything soft, feminine, and fluffy especially for my girls. They are like life-sized dolls and I love sewing for them. So this year, when I realized my oldest daughter will be 5 at Christmas, I knew that I needed to make her one last glorious baby doll dress. I just love them... and I wanted Grace to have one last baby doll dress before she's too old. And since it may very well be her last one I wanted it to be a good one. So I used some heavy, buttery white velvet and then added some gathered tulle at the hem and a black satin bow at the waist. The high waist, the short length, the velvet, the tulle...sure, some may say it's a bit much. But Grace and I, we think it's just right! And....I still have 2 yards of that white velvet left.... Just enough to make the same dress for my 2-year-old. Ahhh!!! Holiday dresses. They may just be my favorite item to make... and wear... and see worn... Thanks again, Suzannah, for letting us join in the fun! If you want to know more about this dress, join us over at Simple Simon and Company and see other dresses that we've made from the same pattern! So pretty, liZ!! What a lucky little girl! 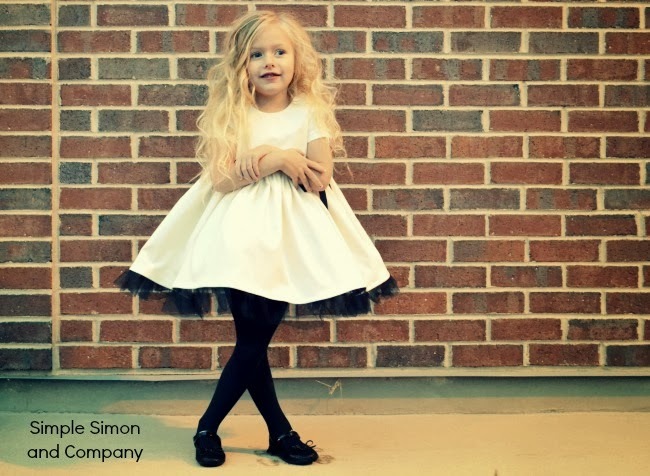 =) I always admired these classic fancy dresses when I was little, but never had something so fun and dressy! Great to have a little girl's dress in the holiday party dresses mix! I've got two more to share this wee, so, stay tuned!